The birthstone for March is Aquamarine. Aquamarines are the best example of a stone living up to its literal meaning, Aqua (water) and Mare (Sea). The aquamarine gemstone is believed to keep sailors safe at sea. Aquamarines are a very hard stone. Therefore, the much larger pieces that have more inclusions were often carved into figurines depicting sea life. This stone has hues ranging from deep blue to practically clear blue. Aqua's are part of the Beryl family along with Emeralds so the greenish color does come through very often. 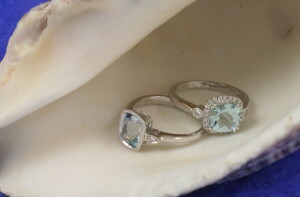 The deeper the blue color of Aquamarine's the higher the value.